Figure 1 Principle strategies to reduce the algae biomass based on the relationship between mean total P concentration and chlorophyll a (logarithmic scaling) in lakes. A indicates reduction of P concentration in the lake water, and B indicates changes of internal structure without reduction of P concentration. 1. The time required to reach the new steady state (adap tation time) after reduction of the external nutrient load is longer than the time available, for example, due to political and economic reasons (tolerance time). The adaptation time increases with water resi dence time and with high internal loading of P that has accumulated in the sediment during eutrophication. Internal measures can help to shorten the time to reach the target P concentration after abrupt external P load reduction (Figure 2a). 2. The response of a lake to changes in the nutrient level is nonlinear. In shallow lakes two alternative stable states exist over a certain range of nutrient concentra tions. 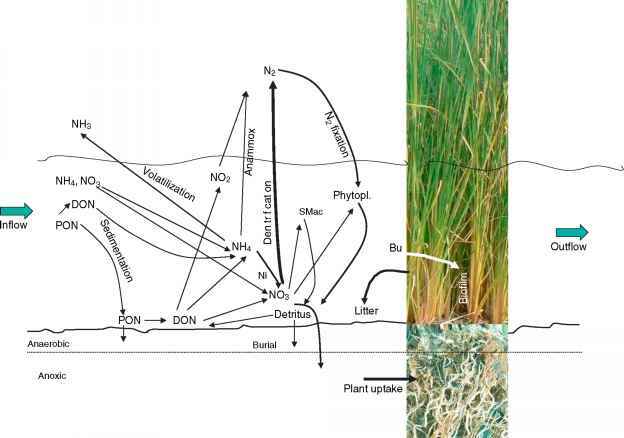 Increasing nutrient loading in shallow lakes results in a shift from the clear (macrophyte domi nated) state to the turbid (phytoplankton dominated) state (Figure 3). The hysteretic curve in Figure 2b shows that the nutrient level needed for recovery can be much lower than the nutrient level at which the lake originally switched from clear to turbid. This is due to stabilizing mechanisms that cause resilience. Internal measures may either decrease the P value temporarily below the necessary threshold level or perturb the biological structure that stabilizes the turbid state. 3. The necessary external load reduction cannot be rea lized or only at very high economic costs. This is often the case when nonpoint sources dominate the loading. A combination of external and in lake measures leads to a better cost-benefit ratio, and the efficiency of in lake measures increases when the external P loading is substantially decreased (Figure 2c). Figure 2 Schematic illustration of the main reasons for the application of in-lake measures to control eutrophication in lakes and reservoirs. 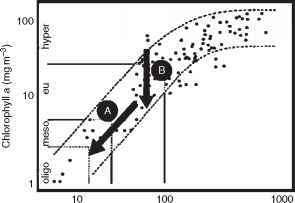 (a) The tolerance time is shorter than the adaptation time to obtain the new steady-state P concentration (Pstat) after abruptly decreased external P loading. The three scenarios based on mass-balance calculations show that additional in-lake measures such as P inactivation and hypolimnetic withdrawal shorten the time for reaching the target P concentration. (b) Temporary decrease of P concentration below a threshold level (PB) or perturbing the biological structure to break the resilience of an undesired stable state. 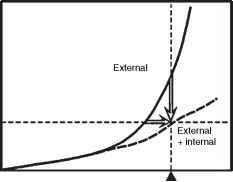 (c) Combination of internal and external measures increases the benefit-cost ratio (see text). ▼ indicates target of measures. The target P concentration and the acceptable P load ing can be estimated by empirical eutrophication models and by mass balance approaches. The P availability in the lake water can be decreased by reducing P input, increas ing P retention in the sediment, or increasing P export (Figure 4). Phosphorus in the sediment is allocated in temporary and permanent P pools. The P release poten tial depends on the temporary P pool, which is of high importance for the lake's response after external loading reduction and for the efficiency of some in lake measures. Therefore, the temporary P pool in the sediment needs to be taken into consideration in prediction models and during the selection of appropriate restoration measures. Phosphorus load can be reduced by (1) decreasing P emissions, (2) increasing the P retention capacity in the catchment, or (3) purification of inlet water immediately before it enters the lake.